The Cleveland Browns do not have the Hall of Fame lineage at quarterback of the Green Bay Packers or Indianapolis Colts. Regardless, there have been fan favorites over the course of the last 72 years with Frank Ryan, Milt Plum, Bill Nelsen, and Mike Phipps endearing themselves to many. But, the holy trinity of Browns quarterbacks is undoubtedly Otto Graham, Bernie Kosar, and Brian Sipe. One question of the current signal-caller is if Baker Mayfield will be able force fans to consider a Mount Rushmore of quarterbacks instead. He has quite a ways to go to pass the color-blind Vinnie Testaverde, the golden-arm of Tim Couch, and even the flash in the pan that was Kelly Holcomb. Yet, there is something different to watching Mayfield operate compared any quarterback from the expansion era of the Browns. Let’s take a look at who he needs to match up against if he is to be considered one of the Browns’ all-time greats by the end of his career. Otto Everett Graham Jr. was the first official member of the professional organization that became the Cleveland Browns. The six-foot-one, 196 pound athlete started off on scholarship for basketball and just playing intramural football for fun. He would successfully transition into the professional sport that would make him a legend but not before winning a National Basketball League championship in 1946 with the Rochester Royals upon returning from World War II. The Northwestern University graduate had been drafted by the Detroit Lions of the NFL fourth overall but elected to sign-on with Paul Brown and an AAFC team in Cleveland. The greatest quarterback in the history of football finished his NFL career with a 57-13-1 record,1 while playing in 10 straight title games with seven championships (four AAFC titles, three NFL championships). His 174 touchdowns remain a franchise record as does his yards per attempt (9.0) and NFL victory count (57, excludes his dominant seasons in the AAFC). His career exploits earned him his spot inside the Pro Football Hall of Fame in Canton, Ohio. Brian Winfield Sipe was drafted by the Cleveland Browns in Round 13 of the 1972 NFL Draft (No. 330 overall). In the current NFL landscape, he would be not only an undrafted free agent but one of the last of those to sign. The San Diego native did not make an appearance for the Browns until 1974. He was not a starter until 1976. He did not lead the Browns to the playoffs until 1980 and was out of the NFL after the 1983 season. Still, mentioning the name of Sipe to any diehard Browns fan from that era will bring about warm memories. Despite the move to a more pass-friendly NFL, he still leads the franchise in yardage (27,713) and NFL wins (57, tied with the great Otto Graham). He remains the lone NFL MVP in Browns history not named Jim Brown (who won the award three times). The Kardiac Kids moniker was well-earned as he led the Browns to 11 game-winning fourth-quarter drives in just the 1979 and 1980 seasons even if Red-Right 88 would become the first among many phrases to bring about instant heartbreak since the 80s. Bernie Joseph Kosar Jr. pulled some shenanigans to ensure the Youngstown native could return to Northeast Ohio after taking his talents to South Beach for four years. The Miami Hurricane was a six-foot-five blue chip player who was greatly sought after by NFL teams. It required entering the supplemental draft after the Browns had acquired the first overall selection in it to land him in Cleveland. The side-armed bandit had laughable mobility in the pocket that continued to degrade with age. Injuries would shorten four of his nine seasons with the Browns. A release due to diminishing skills would cut short another. Kosar would become best known nationally for being on the wrong side of The Fumble and The Drive against John Elways’ Denver Bronco teams. The curly-haired wonder does not hold any significant franchise records, made just one Pro Bowl in his career, and was never a serious contender for the Hall of Fame. In Cleveland, however, he was and remains a folk hero. Ballads were written in his honor. Young and old fans alike wore his jersey, mimicked his wonky release, and even permed their hair to match the leader of their team. The Browns won the AFC Central Division in four of his first five seasons at the helm. They finished second in the one he started less than 10 games. In three of those seasons, the Browns made the AFC Championship Game– though losing each to the Broncos. The kicker of the ballad might have fallen a game short, yet the song remains firmly entrenched in collective minds of any fan of the 80s Browns. Bernie, Bernie. Oh, yeah! How you can throw! 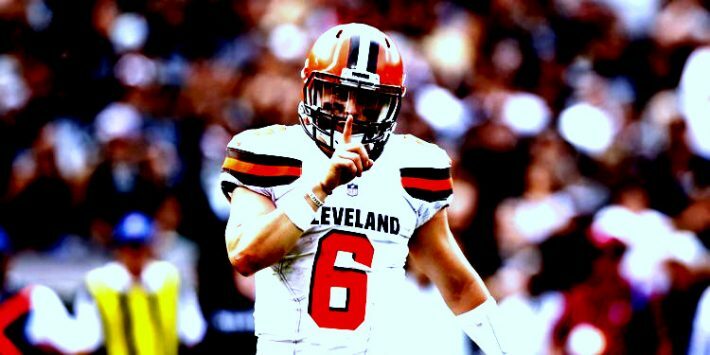 The more recent quarterbacks of the expansion era might resemble more of a molehill than a mountain, but Baker Mayfield is not aiming for such a meager legacy of being the best quarterback since 1999. It is obvious the brash player is feeling dangerous and hopes to awaken the rich legacy that is Cleveland Browns football. Whether or not he is able to join the likes of Graham, Sipe, and Kosar remains to be seen, but anyone betting against him is playing against the odds.